The Arctic: As used in this document, the term “Arctic” means all United States and foreign territory north of the Arctic Circle and all United States territory north and west of the boundary formed by the Porcupine, Yukon, and Kuskokwim Rivers; all contiguous seas, including the Arctic Ocean and the Beaufort, Bering and Chukchi Seas; and the Aleutian chain. 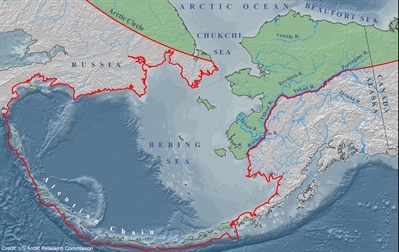 For purposes of this document only, this map illustrates the Arctic as defined under the Arctic Research and Policy Act and does not represent or reflect the position of NOAA with respect to the international boundaries and limits depicted therein. The Arctic has profound significance for climate and functioning of ecosystems around the globe. The region is particularly vulnerable and prone to rapid change. Increasing air and ocean temperatures, thawing permafrost, loss of sea ice, and shifts in ecosystems are evidence of widespread and dramatic ongoing change. As a result, critical environmental, economic, and national security issues are emerging, many of which have significant impacts for human lives, livelihoods, and coastal communities. Though NOAA has numerous and diverse capabilities that support these emerging issues, a strategic approach that leverages NOAA’s existing priorities and strengths, as well as those of our national and international partners, is needed. This document provides a high-level framework and six strategic goals to address NOAA’s highest priorities in the region. It is based upon assumptions that the region will: 1) continue to experience dramatic change, 2) become more accessible to human activities, and 3) be a focus of increasing global strategic interest. NOAA envisions an Arctic where decisions and actions related to conservation, management, and use are based on sound science and support healthy, productive, and resilient communities and ecosystems. The agency seeks a future where the global implications of Arctic change are better understood and predicted. These goals were selected because they represent areas where NOAA can address urgent and timely issues that meet two key criteria: providing the information, knowledge, and policies to meet NOAA mandates and stewardship responsibilities, and providing the information, knowledge, and services to enable others to live and operate safely in the Arctic. Each goal also fulfills international goals and establishes, enhances, or leverages partnerships with other Arctic nations, international organizations, government agencies, and non-governmental organizations, academia, and local communities. The goals are also geared towards generating large societal benefits relative to the resources required and strengthening NOAA’s engagement, politically, scientifically, internationally, and publicly. Plan will also include an engagement strategy for reaching internal and external employees, partners, and stakeholders, as well as a detailed budget strategy. NOAA is committed to enhancing its current involvement in research and management programs in the Arctic, and anticipates an initial investment of $10 million towards the implementation of this strategy, recognizing that additional funds will be needed to achieve the goals.